3, Share APP to families to control home devices. 5, Timing schedules for home appliance. 【WORKS WITH ALEXA AND VOICE CONTROL】- Perfectly works with Amazon Alexa, Google Assistant and IFTTT allows you to control home devices from APP on mobile phone with voice command. 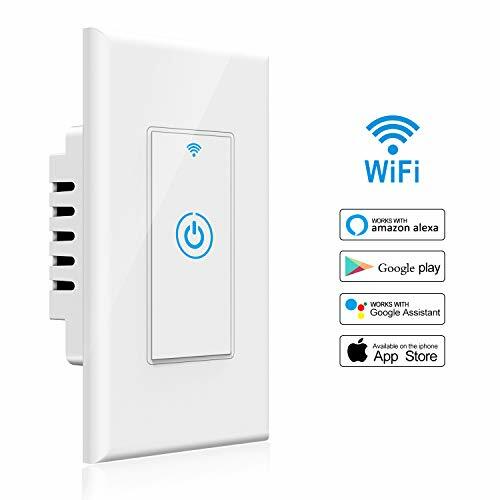 【APP REMOTE CONTROL】- Download the free APP on tablet or smartphone, and connect 2.4G(NOT 5G) wifi to turn on/off light or other appliance remotely via the APP from anywhere anytime. 【TIME SCHEDULE AND AUTOMATIC SETTING】- Create schedules to automatically power on or off home electronics and appliances at anytime to save energy. 【TOUCH AND DEVICE SHARING】- Turn on by one touch on switch plate. Make life easier by sharing access permission to families via Smart Life APP. 【LED BACK LIGHT INDICATOR DESIGN】- Sensitive key touch design with LED back light, help you turn on the lights worry - free in dark night.